It was very cloudy this morning. Was not predicted but we were completely clouded in when we took our morning walk. By 11:00 the sun was out and our high today was 81. It was hot in the sun. We started the day with our morning walk then had breakfast. There were more clothes to go through from Mama Ruby’s closets and more business to handle and letters to write. Max grilled us a wonderful ribeye steak for lunch with potatoes and salad. It was so good. We decided this afternoon to start washing FRED. Today we did the front and driver side while they were in the shade. Looks good! We plan is to get outside early in the morning and do the rear cap and passenger side while they are in the shade. We were told that we should not wash FRED for 6 months to allow the paint to completely cure. We have waited a bit more than 6 months but life just sort of got in the way of good intentions. 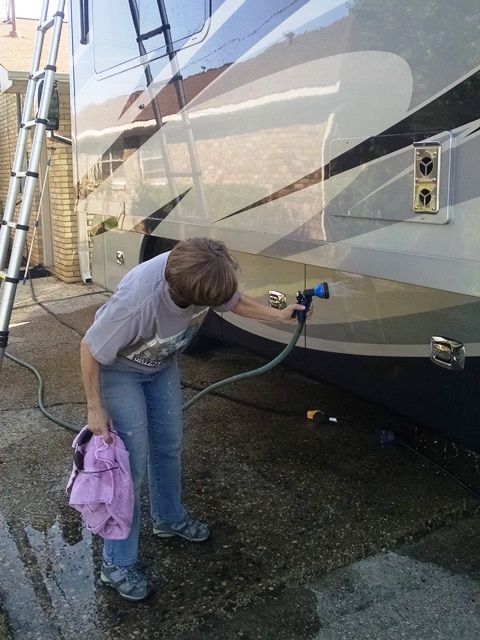 Our usual schedule is to wash at least every 6 months and wax 1-2 times per year. We did another nice walk on the greenway this evening and got a couple of milkshakes. That was our day. We will be back on the road in another 2-3 weeks and the blog will get more interesting. However, this is life for now and it is all good. Painful and hard at times, but good.